Agate are named after the river Achates in Greece, where it was discovered and names by Theophrastus in ancient times, in about the 3rd to 4th centuries BC. There are many varieties of agate that can be found throughout the world, some of which exhibit beautiful colors, banding, quartz lined cavities, eye agate, scenic agate, dendrite agate, and moss agate. Agate slices come from Agate geodes which are formed in volcanic lava which contain gas bubbles that fill with water and turn to quartz. 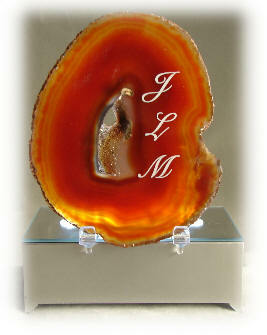 Agate is quartz with impurities mostly translucent. 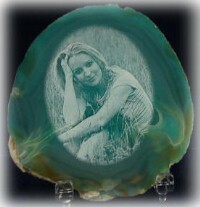 The color of agates can vary significantly, depending on the distribution of minerals within each band. Minerals that contribute to the stone color include: Iron Oxides(red, brown, black, green) Manganese(pink, violet, black),Chromium(green, yellow, red), Titanium(blue), Cobalt(red), Nickel(green) and Copper(red, blue, green). The shade of color is further modified when the above minerals work in combination. The color can occur through an agate band, or it can form as small, dot-like inclusions, Color can be influence via temperature, radiation, pressure and weathering. On the Mohs' hardness scale Agates have a hardness of 7, Marble is 2.5 - 5, Granite 7 - 8 and Diamond is 10, the hardest of nature's materials. 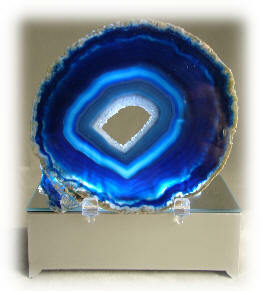 Metaphysical Properties: Agate is a stone of balance, precision, perception and eliminates negativity. 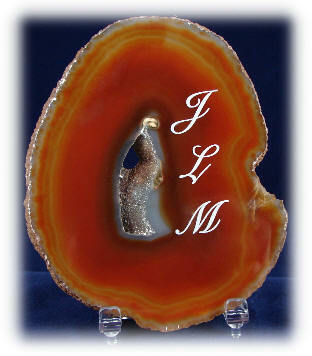 Size is by longest points, Agates form in many shapes. We can not pick only certain shapes. Some are round and some are oval. We can not promise shapes to be round, ect. Thickness varies from 1/8th to 1/4th of an inch. We do promise every agate to be LaserGrade quality. Discounts Applied to the Order Total during Checkout. To receive your Discount, Add Items to the Shopping Cart, and in the Shopping Cart enter the Discount Code in the box Provided. We have Purple also, please call. 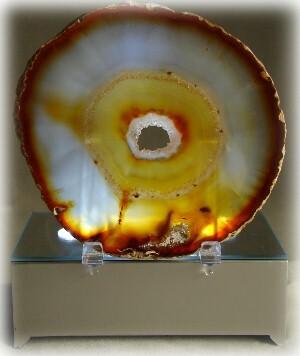 We also have larger agate, please call. Agate Easel, 2-1/8", wide x 2" tall, 2-1/8" depth,set of 10. 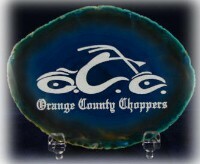 $8.50 Great for Agate slices, small marble or granite plaques, or many other uses. Great for display. Larger quantities available, please call. 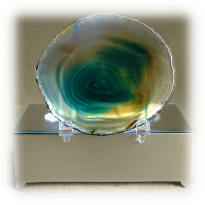 Agate Easel, 2-1/8" wide x 2" tall, by 2-1/8" Depth, set of 50. 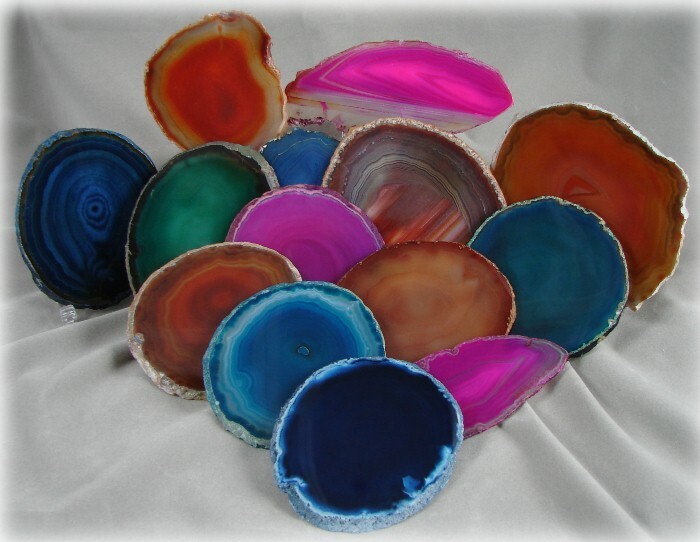 $37.50 .75 each Great for Agate slices, small marble or granite plaques, or many other uses. Great for display. Larger quantities available, please call. Agate or Marble Easel, 2_1/8" wide x 2" tall by 2-1/8" deep, set of 100 $65.00 .65 each Great for Agate slices, small marble or granite plaques, or many other uses. Great for display. Larger quantities available, please call. © Copyright 2015 Laser Stone Midwest. All Rights Reserved.